Mary Beth Berg’s injury and medical history reads like the over-the-top hypotheticals presented to students studying for their sports medicine boards - or the tort bar. After a navicular stress fracture kept her on crutches and in a boot from October to December 2011, she strung together a six-month training block that remains one of the most consistent and productive of her athletic career. That block ended in October 2012. A serious drop-off in a two-mile time trial prompted testing for anemia, which revealed low ferritin levels. The next month her iron dropped even more, along with a serious drop in weight leading to fluctuations in weight. The new year brought trouble with breathing during practice, nervous system issues and metabolic abnormalities. Her coaches pulled her from training in April 2013, pending some insight into what was happening. In August she began treatment for Hashimoto’s thyroiditis, but still another two months would pass – over a year since symptoms manifested - before she began treatment for the actual root cause: mold infection, which took root in nearly every system in her body. Treatment at a specialty clinic put her to the point where she could resume workouts towards the end of indoor track season, albeit with significant levels of difficulty and exhaustion during previously manageable sessions. Things came to a crashing halt in April 2014. An 18-wheeler truck rear-ended the SUV Mary Beth was driving. The impact drove her left leg into the bottom of the steering wheel, fracturing her femur near the midpoint of the femoral shaft. She returned to training in the fall and switched to a new training group, leaving the long sprint groups to train with the short sprinters. This regimen took her through the spring when she could return to her original event group and race consistently. After everything of the last four years she made plans for a fifth year of college eligibility. Instead, her Division I career ended in an appropriately absurd tangle of NCAA compliance issues. Around this time is when she contacted me about joining the Austin Track Club as a 400m / 800m runner. After verifying her frankly unbelievable story point-by-point with her college coach – including whether and why she actually had an ambition to continue despite all of this – we began working together, first remotely and then in person. Our time together was marked by a great disparity between what she could produce in the weight room compared to what she could do on the track. She still had lingering metabolic, digestive and autoimmune complications from the mold infections, which impacted micronutrient absorption and availability. But what ultimately did us in was another cruel joke of nature. In the middle of 2017 Mary Beth was diagnosed with bilateral hip dysplasia, which explained the increasing pain she felt in her hips while running or during repeated jumps. Simply put, her hip socket was too shallow. Less simply, she also had a femoral impingement and a torn labrum, the latter of which was secondary to the two morphological dysfunctions. Her first surgery in December 2017 was a three-in-one on the right hip: arthroscopy to repair the labrum, femoral osteoplasty to remove the impingement and periacetabular osteotomy (PAO) to correct the dysplasia. The PAO involves cutting through each of the three bones of the pelvis so the surgeon can rotate the acetabulum into a position that provides more coverage over the head of the femur. Four titanium screws – the largest used in the human body – secure the bones in their new position for a year after. Mary Beth did physical therapy for four months after the surgery and began light running in the late spring. She knew she would eventually need surgery on the other side, and through the summer the ease of motion on the right (post-surgical) side and increasing pain on the left put the second surgery on the schedule for December, almost one year to the day after the first. This case study picks up in October 2018: 10 months after the procedures on the right, two months before the same procedures on the left. She and I were both looking for a chance to be athlete and coach again, and some unrelated conversations with the PUSH team put the wheels in motion. Beyond simply rehabbing her post-surgical side, our main purpose in this study was to establish baselines we could use to track her recovery from the second surgery into her return-to-play process. Because we came up with this idea in August 2018, we do not have any pre-surgery data from the right side. Nor do we have any PUSH data of her kinetics from pre-surgical bilateral exercises – only our experience and logs from training together, which give us the basics of load, volume and timing. Additionally, she was medically cleared for this kind of activity six months after the surgery. The second stage of this case study will start much sooner post-op on the left than the first stage did on the right. Therefore, we expect to see some variation in the initial outputs and timelines. However, the symmetric nature of her dysfunctions and surgeries lend themselves to making comparisons. Her left (intact) side can be a proxy for her pre-surgical right side. We can compare her post-surgical right to her pre-surgical left for an approximate look at where she is relative to her pre-surgical state. Meanwhile, the data we collect from her left side will be a true baseline for her recovery on that side this summer. We can also compare the initial post-surgical values and time course of progression between the two sides. These will help us understand any effect of the different starting times, as well as projecting an estimate of when she will have similar kinetic outputs on each side: a milestone in her transition from rehab to return-to-play. Our secondary purposes were to explore PUSH’s use in the rehab / R2P processes and in remote training. I’m a proponent of “training as testing, training is testing.” The routine data that measures a player’s progress towards performance goals sets the point of departure – and ultimately the point of return – if that player suffers an injury. Such data can also serve as an early warning system for injury risk, which in turn can make it useful for injury prevention work. This data also would be useful for the physical therapists who own the first four months of the post-surgery process. And, as PUSH and other technologies attain fuller adoption and validation, for the surgical team as well. Mary Beth’s surgeon noted how her training history developed enough strength in her supporting muscles to compensate for her dysplastic hips, allowing her to train longer and harder than the morphology would otherwise suggest. Data such as PUSH’s provides valuable context to an athlete’s or team’s entire sports medicine staff, not just the strength & conditioning coaches. Admittedly, had we come up with the idea for this case study a year earlier – or if I had used PUSH while training Mary Beth previously (mea culpa, Mary Beth and Rami) – we would have had a wider and more valid range of benchmarks. The overriding consideration in our program design was caution. I have never worked with an athlete or client coming off a surgery as significant as this one. Despite our familiarity, I have not seen her since the surgery and we were working remotely. This meant I did not have any insight into compensations or quality of movements other than what she reported. As a result, I was not able to give any cues or modify the programme based on form or any other observation, only her feedback. We divided the training into three mesocycles of 3-4 weeks each, with two sessions each week. Each session would have 3-4 circuits of a superset focused on movements through the hips, followed by 1-2 ancillary circuits of medicine balls throws or upper-body exercises. The hip-focused supersets for the first two mesocycles were balanced along single leg vs. double leg and push / pull exercises. We would use either the main circuit or the ancillary circuits to incorporate all planes of motion. The first mesocycle was cautious exploration. We used the first part of this block to find out which exercises were safe and comfortable for her; obtain an understanding of her tolerance for load and volume; and re-acclimate her to a resistance training programme. Pistol squats were the only exercise we removed. Her response validated our expectations for load and volume, so we made minimal changes. The second part of the block, then, continued seamlessly from the first. The sessions of the second mesocycle were nearly identical the first. Our emphasis here was aggressively but safely progressing the loads. After completing the first set of her circuit as written – call it a safety check - she was free to increase the loads at her discretion. We used her progression through that circuit to determine the first set of the following week’s session, and then repeated the process for steady increases in load. Knowing that she had a long layoff ahead of her, we stepped up the intensity for the third mesocycle to maximize her adaptations, her personal satisfaction and our data collection. The sessions now started with a set loosely modeled on French contrast, repeated 3-4 times. This was followed by a set of hip-centric exercises balanced on the same lines as those of the first two mesocycles, and then the auxiliary upper body or med ball set. One of our main hypotheses did not survive the first two weeks. Given the invasiveness of the surgery, her minimal amount of resistance training in the intervening nine months and her pre-surgery strength levels, we assumed the first few weeks – if not the entirety of the case study – would be bringing the right / post-surgical side up to the level of the intact left side. We went in thinking her left side would out-perform her right for any single-leg exercise and that her training data would not show the benefits of the surgery until we rebuilt her strength. We were wrong. From the first session Mary Beth produced greater force and power – both peak and average – with her right leg in four foundational exercises that stress one side over the other: barbell single-leg Romanian deadlifts, dumbbell single-leg Romanian deadlifts, goblet side lunges and split squats. Her right-side advantage was greater for power than force in the first three exercises. When performing split squats, she had a greater right-side advantage for force. 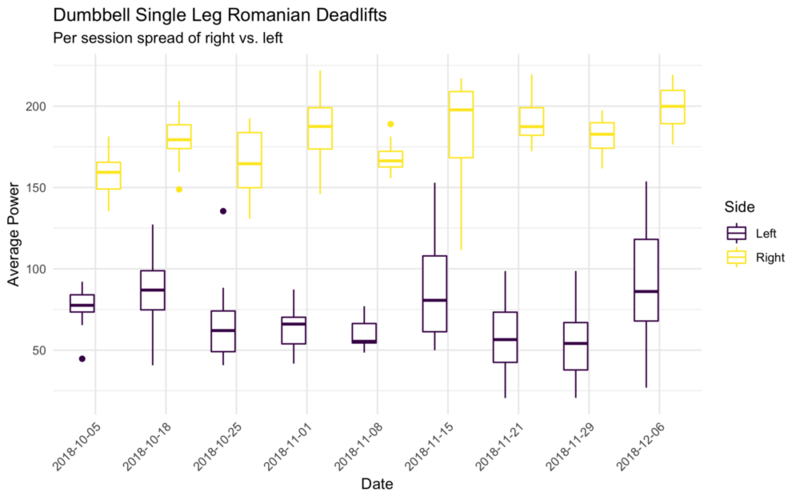 The two forms of single-leg Romanian dead-lifts (SLRDL) produced some of the more interesting findings. The barbell SLRDL was the only exercise with a noticeable trend towards a reduced right-to-left ratio over time. By the last two sessions she was producing more power on the left side than the right. This could be due to an increase in load over the course of the programme. On the other hand, the dumbbell SLRDL showed some of the most unusual variations. The mean right-side advantage (the ratio of right-side output to left-side output) over the course of all sessions for average power on dumbbell SLRDL was about 2.6. For peak power, it was 2.5. The single-session maximums for average and peak power were 3.3 and 3.2, respectively. None of the other exercises had a single session right-to-left ratio greater than 1.6. Moreover, force production on dumbbell SLRDLs showed a consistently low right-to-left ratio, between 1.01 and 1.05. Unlike power production, this is consistent with the range she produced on the barbell SLRDLs. Differences in velocity readily explain the differences in power production between the two sides in dumbbell SLRDLs. T-tests confirmed the differences in velocity between right and left for each exercise, and the differences in velocity between the exercises themselves. Movement quality and control are at the root of those velocity differences. Because there were so many disparities in the dumbbell SLRDL power data, I asked the PUSH team if they had seen anything like this before, from either the sports science or algorithmic perspectives. Vahid Zadeh, PUSH’s chief technology officer, verified the data was valid and then took a deeper dive into the raw data. His analysis suggested Mary Beth raised her arms up to 45 degrees from the fully downward position while performing the dumbbell SLRDL’s on her left - that is, intact - leg. This compensation could contribute to the slower velocity on the left side, or could be coincident with the slower velocity as another expression of the deficient movement on the left. Compensating like this would not be possible with the barbell. She would be less likely to compensate during the barbell SLRDLs, anyway, since it involves fewer degrees of freedom than the dumbbell SLRDL. Increasing weights also limit the compensatory arm. This may explain why the lowest right-to-left ratios on dumbbell SLRDLs were her first two sessions, when she was still regaining her strength, and on the session where she used the heaviest load. Vahid’s insights were significant for several reasons. First, his reconstruction of the movement patterns bolstered what the kinetic data and Mary Beth herself had been saying: the surgery was a success. Throughout the summer and then during this training programme she regularly said her right side was pain-free for the first time in years, and moved more fluidly than before the surgery. Vahid provided an algorithmic look at how she was moving more freely and more cleanly on the post-surgical side than the intact side. As a result, she was generating more power on her right than on her left side. Second, Vahid helped cover the gap between Houston (where I am) and Chicago (where Mary Beth is). He gave me information I would not have had with any other remote training set-up, short of asking Mary Beth to send me multi-angle video of her every rep. I was fortunate to have easy access to Vahid and his willingness to give me more than PUSH’s off-the-shelf suite of insights. But it shows the latent power in raw movement data, and should keep us excited about what might be over the horizon on PUSH’s product roadmap. Finally, he unearthed another point of comparison for when we start training again this spring. After the first few sessions with dumbbell SLRDL’s this spring, we can ask Vahid to take another look at the raw data to see if the compensation is still present on the left side. If it is, Mary Beth and I will take a deeper look at her form, perhaps having her take some video that we can review and work on supporting exercises and cues. If the compensation is no longer there, we have one more pre / post measure of the effectiveness of the procedures. The disparities between her right and left side greatly limit what we can learn from the bilateral exercises. We know her left side is the limiting factor, but without any pre-surgical data we do not know to what extent. Because of the circumstances we were working under, we stayed in a very small portion of the force-velocity curve. We were not inclined to work at any loads that would move us towards the high force / low velocity areas. Conceptually, I envision the development of the force-velocity curve to be part of the transition from rehabilitation to return-to-play. The F-v curve will take shape as we progress through loads that move her velocity away from the asymptotic portion of the graph and into the velocity-based training zones (even if we will not yet be thinking of them as such). Reestablishing a well-defined F-v curve will be a sign of her capacity to work over a functional range of speeds and loads, which is a useful marker of her progress. With an initial F-v curve in place, our focus will shift to training her along that curve as we would any other athlete. An interesting question for coaches who have a pre-injury or pre-surgery F-v curve is how an athlete navigates her way back onto and along that curve during the rehab / R2P process. How does an athlete’s force- or velocity-dominance before the trauma predict or impact the progress of their recovery, and therefore how should it affect the programme design? What should the specifics of the trauma itself tell the physical therapists and conditioning coaches: will some injuries or procedures have a greater impact on one side of the curve, or is it the interaction of the athlete and the injury? How can and how should that feed into the rehab process? This is where technologies like PUSH can shift the approach in rehab settings from movements and functional movements to functional outputs almost from day one. Measuring velocity, acceleration and force production do not have to be contingent on range of motion. An athlete’s kinetic output from a reduced range of motion has as much clinical value as that range of motion, all the more so when we know how it tracks with the pre-injury outputs. Those insights could also shape preventative training programmes. If you know that return-to-play from a specific injury common in your sport - or recurring in one of your athletes - is more constrained by force or velocity production, you can develop a larger buffer in the athlete’s capacity and mitigate that constraint. On the day I made my final edits to this blog Mary Beth ran on the Altar-G treadmill for the first time since her second surgery. Her physical therapy has her on track for us to start the second stage of this case study in May. We plan repeat the programme from stage I. When we see equal outputs from the right and left side, as well as significant improvement (10-15%) over the baselines we set here, we will then shift her resistance training towards a sport-specific context, so by the early autumn she is training as the runner she is. The results from the second stage of the case study will appear on the PUSH blog this summer. If you would like to see more after that, please let us know in the comments or give a shout to the PUSH team.